The Torsion Bar Setup v2.0. The first version of the Torsion Bar (v1.0) setup is equipped with a PWM controlled H-bridge motor amplifier. This corresponds to a velocity-controlled motor. The new Torsion Bar v2.0 contains an ELMO Whiste motor amplifier that can be used in current-control, voltage-control and position-control mode. 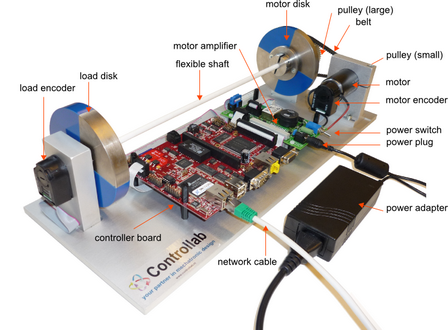 The Torsion Bar v2.0 setup uses the current control mode, which corresponds to a torque-controlled motor. •2 x LVDS Quadrature Encoder Inputs. •1 PWM-to-current output, to drive the motor via an ELMO Whistle current amplifier which is mounted below the interface board.